1 a day. Hayfever & other allergies. 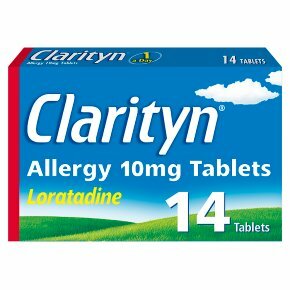 Relief of sneezing, runny nose and itchy eyes.Loratadine To relieve allergic symptoms due to hayfever and other airborne allergies, such as house dust mite and pet allergies. Can also be taken for allergic skin conditions such as rash, itching and urticaria (hives). Please read enclosed leaflet before using this medication. For oral use. Dosage: Age and weight: Adults and children 6 years and older who weigh more than 30kg (4st 7lb), How much to take 1 x tablet, How often to take: Once daily Age and weight: Children who weigh 30kg (4st 7lb) or less, How much to take: Not recommended, How often to take: Not recommended. If you have severe liver problems your doctor or pharmacist may advise you to take the recommended amount every other day. If this applies to you follow their instructions. Warnings: Do not exceed the stated dose.<br>Do not use during pregnancy or if you are breastfeeding.<br>If symptoms persist consult your doctor or pharmacist.<br>Keep all medicines out of the reach and sight of children.